I first encountered Cas Holmes when I was putting together a list of textile artists that I wanted to include in an exhibition which I was invited to curate - ArtCloth: Engaging New Visions. I was well aware of her work when I asked her whether she would be a contributor to my exhibition. She concurred. Cas produced a diptych - Black Birds I and II - which reflected her interest in the open landscape, the shadows of marks made by man on the earth, the reflections in water and flooded fields, gardens and seasons changing. She grew up in the wind-swept fenland water and woods of Norfolk. Crows, ravens, magpies, and "black birds" were familiar to the landscape of her life. 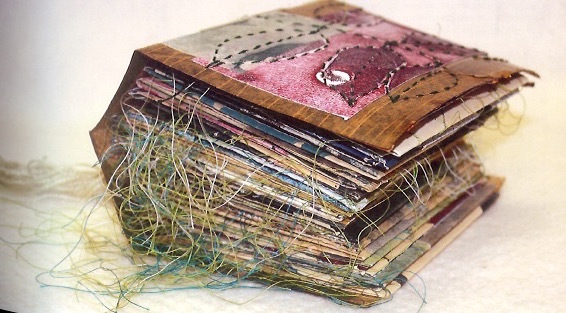 She created her work on found fabrics and paper, which further emphasized her commitment for a recycled world. Artist and Title of Artwork: Cas Holmes - Black Birds I and II (full view). Techniques: Print, paint, dye and stitch. Layering with paste. 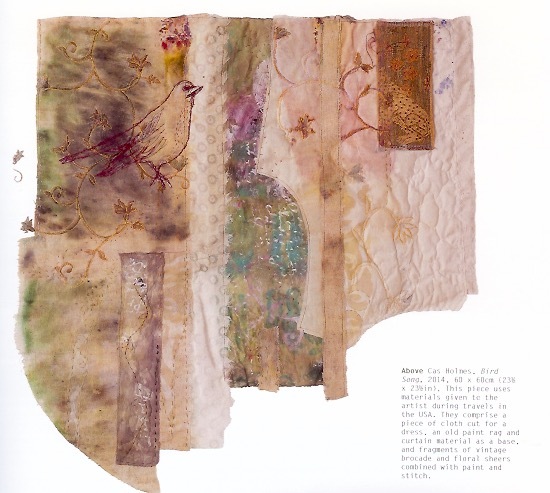 Media: Cold water dyes, acrylics, conservation paper, assorted muslin and cotton fabrics, wax rubbings, ink. Cloth Type: Found fabrics and papers. Size: 60 cm (width) x 300 cm (length) for each artwork. Since that time we have kept in contact. We have conducted workshops at the same venues in Australia and elsewhere. I was also asked in 2014 to open an exhibition - Memory Cloth - at the Museum de Kantfabriek in Horst (The Netherlands) - which featured artworks by Els van Baarle, Glenys Mann, Cherilyn Martin and Cas Holmes. 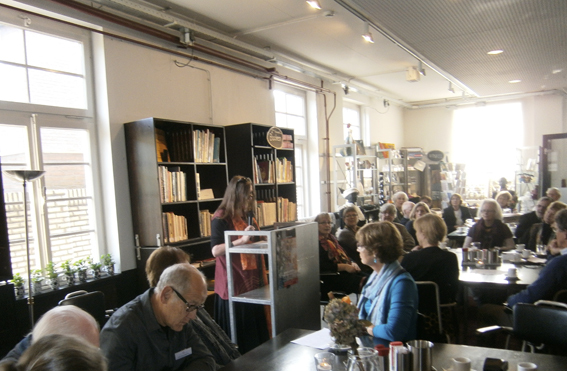 Marie-Therese Wisniowski giving the opening address at the "Memory Cloth: Remembering in Textile" exhibition. I have hosted her in Australia and when I did we talked and talked and talked about textile/fiber art. If we had quiet moments of reflection, Cas would produce paper and water color paints and sketch or doodle what her mind's eye would see and interpret her surrounds. Clearly, she was sketching new ideas that at some later time might find their way into her textile artwork. It was an act of creating resources from surrounding inspirations. As you can see I am biased on a number of fronts: I like her textile/fiber art; I like her ideas; I like the fact that she wants to share her knowledge with others. 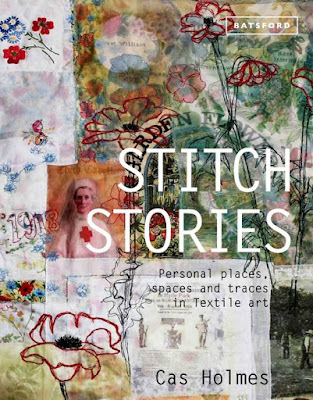 Front cover of Stitch Stories. 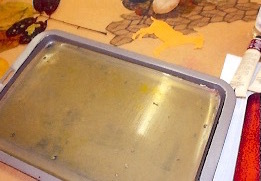 Gell plate and materials set up ready for the first printing. Photograph courtesy of reference . 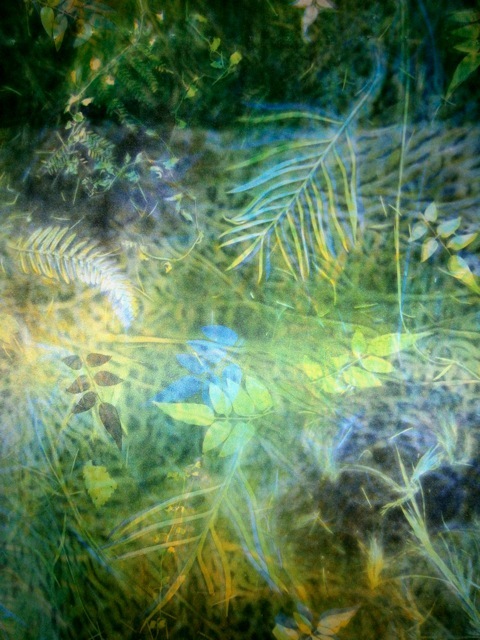 Artist and Title of Artwork: Peta Lloyd - Botanical Goats (2013). Materials and Techniques: Tea-dyed envelopes, mail ephemera, gelatine prints, tar paper, collage stitch, ficus and gum leaves. Size: 30 x 25 x 20 cm (closed). Materials: Fabrics, upholstery tassel's and jute rope. 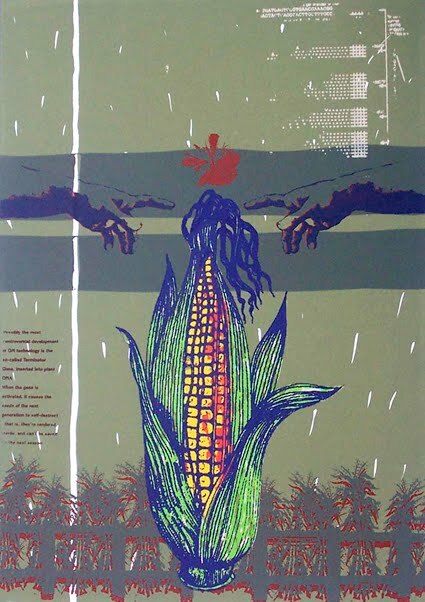 Size: 96 x 197 cm (37.75 x 77.5 inches). The book does contain a continuing thread of Cas Holmes' work and her approach to her art. 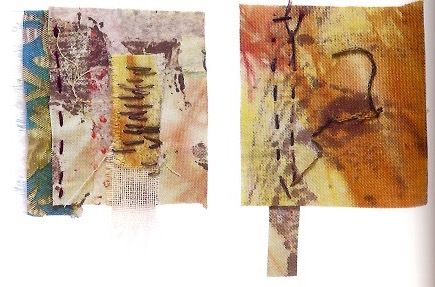 From drawing to cloth - small stitched collages. Chapter 1: "Places, Spaces and Traces" The aim of this chapter is to create methods in which the artist can record their inspiration and/or aspiration - from keeping sketch books to taking photographs to other forms of recording ideas (such as collecting found objects, materials etc). This chapter also contains exercises in order to better hone the recording practice. 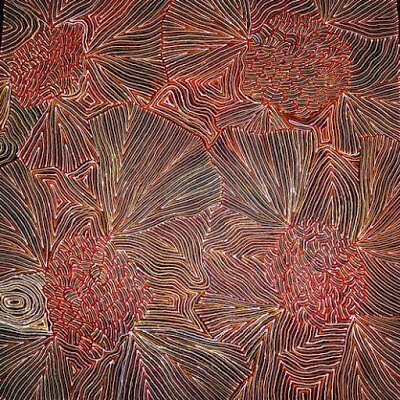 Artist and Title of Artwork: Jane LaFazio - Eucalyptus Blooms (2013). 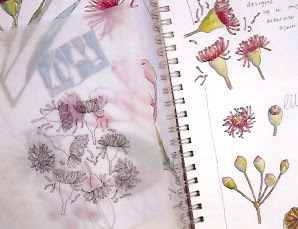 Technique: Drawings of blooms in progress. 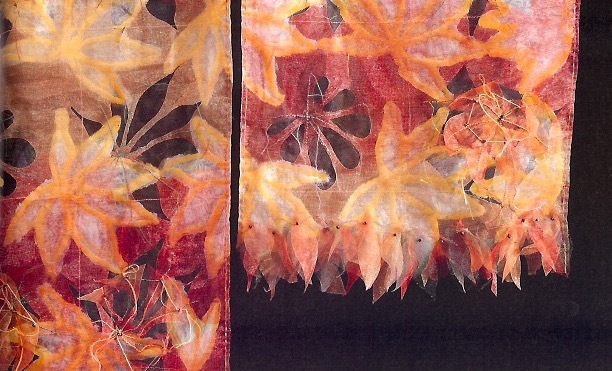 Materials and Technique: Free-motion drawing with sewing machine on to fabric printed with thermofax screens and stencils of blossom. Chapter 2: "Seizing Inspiration" This chapter explores tradition and unusual sources that provide inspiration for a textile artwork. 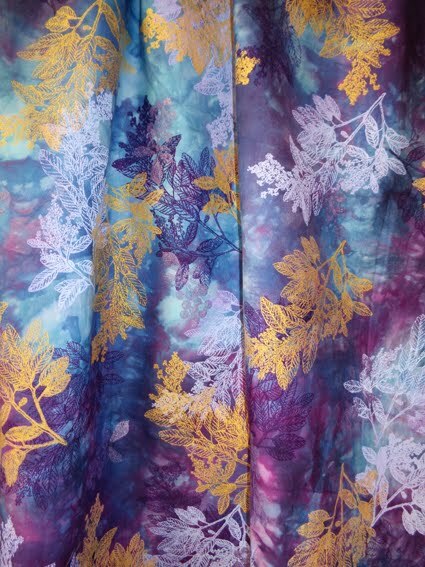 For example, found objects, found fabrics, wall paper patterns, art nouveau designs, mark-making exercises using pens, inks and washes - all can inspire new fabric artworks. 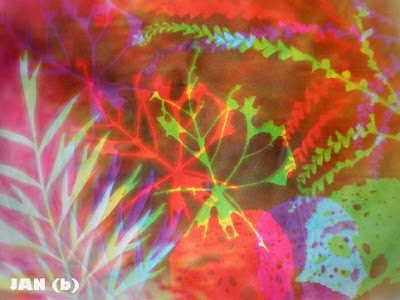 Artist and Title of Artwork: Cas Holmes - Bird Song (2014). 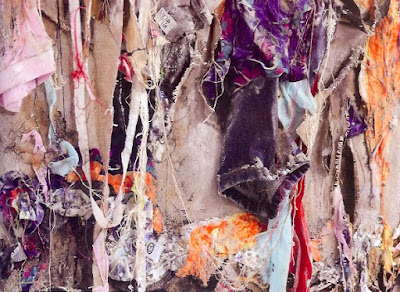 Materials: The artwork incorporates cloth given to the artist during her travels in the USA. Photograph courtesy of reference . 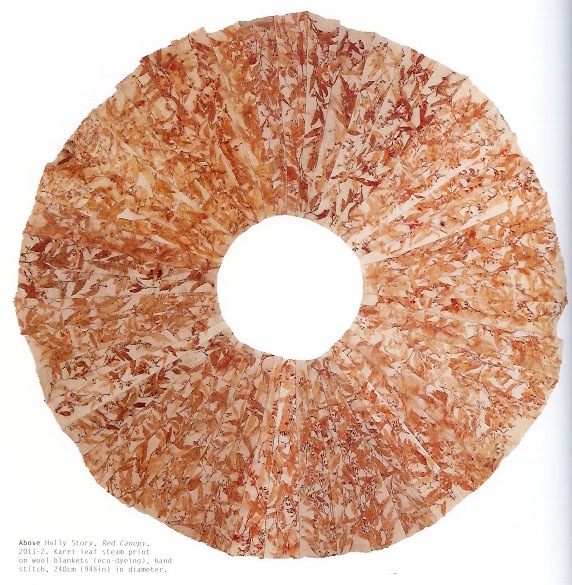 Chapter 3: "The Natural World" The focus on this chapter is on how we can utilize the environment both as a source of inspiration as well as a natural resource to inform our textile art practice. Artist and Title of Artwork: Holly Story - Red Canopy (2011 - 2012). 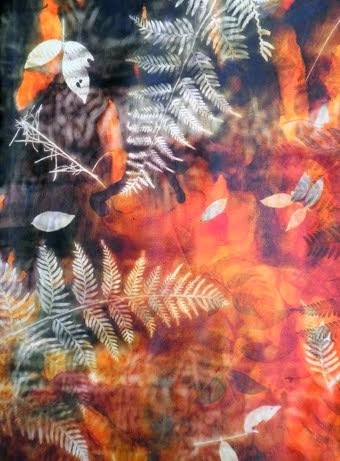 Materials and Techniques: Kerri-Leaf steam print on wool blankets (eco-dyeing) and hand stitched. Size: 240 cm in diameter. Chapter 4: "All in the Detail" This chapter focuses on how artwork can be further embellished in order to yield extra dimensions to it. The artwork becomes layered in detail, meaning and in engagement. Artist and Title of the Artwork: Neil Bottle - Blue (2010). Techniques and Materials: Hand and computer generated images. 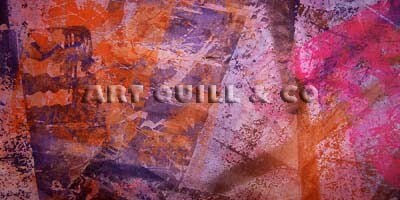 digital-printed cotton sateen wall hanging. Chapter 5: "Off the Beaten Path" The traditions of social and historical contributions of textiles in themselves inform, inspire and help to create new artworks. This chapter looks at personal reactions to these themes. Artist and Title of Artwork: Alke Schmidt - "Aftermath" (2014). Materials: Found textiles - Walthamstow-source fabrics and Western-styled clothes made in Bangladesh as well as shalwar kameez - traditional South Asian dress that was also worn by the Rana Plaza garment workers - as well as thread, acrylic and sawdust on canvas. Chapter 6: "Telling Stories in Stitch" This chapter continues the theme of stitch and social narrative in relation to mark-making on cloth. 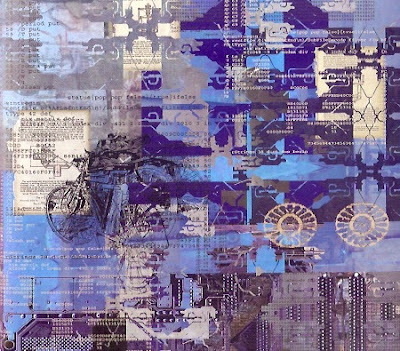 Artist and Title of Artwork: Judith R. Shamp - AkaHappa Kimono (2009). Materials and Techniques: Maple-leaf shapes were cut with a hot knife, leaving positive and negative pattern shapes. Small seed beads give additional detail and textures to the stitching. 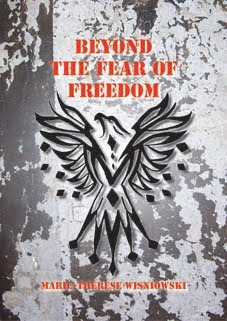 This is a book that deserves to sit on your bookshelf. 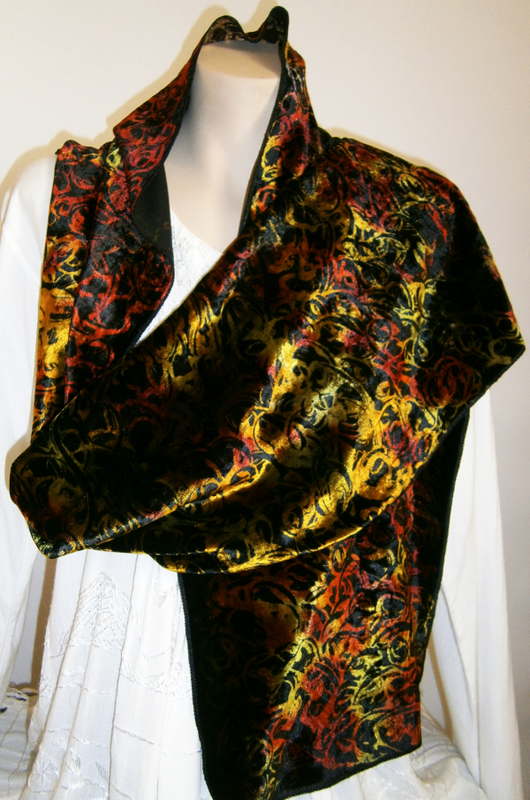 It not only inspires but is peppered with practical techniques and suggestions and so teaches you a myriad of methodologies, one or many of which will translate your inspiration onto fabric. C. Holmes, Stitch Stories, Batsford, London (2015). Beautiful book. Very inspiring! Thanks for keeping it (putting it) on your readers' radar. I love my copy!!! Cas and Jane, thanks for your informative and positive comments ! Looking forward to seeing your new book Jane when it comes out in June ! !